Copper Mill Lane Rubbish Disposal is a minor waterways place minor waterways place place on the waterways major waterways place village town city on the Grand Union Canal (Grand Junction Canal - Main Line - Gayton to Brentford) between Batchworth Junction (Junction with Grand Union (Rickmansworth Branch). Rickmansworth Town Centre, half a mile north.) (2 miles and 5 furlongs and 3 locks to the northeast) and Troy Junction Towpath Bridge No 177A (Junction with the private Troy Branch) (2¼ furlongs to the south). The nearest place in the direction of Batchworth Junction is Copper Mill Lock No 84; ½ furlongs away. The nearest place in the direction of Troy Junction Towpath Bridge No 177A is Copper Mill Lock Weir Exit (No Access! ); a few yards away. Clare House, Coppermill Lane, Harefield, UB96HZ — 260 yards to the northwest. 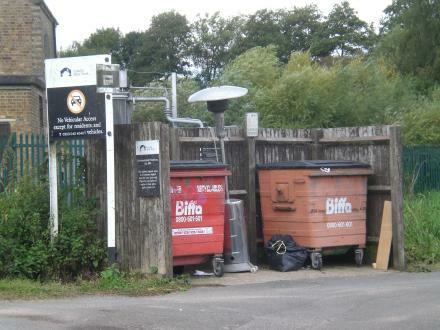 West Hyde Nursery, Old Uxbridge Road,, Rickmansworth, WD3 9XY — 738 yards to the west. 1st Floor, Entrance B, Salamander Quay West, Harefield, UB9 6NZ — 112 yards to the south. 73 Dovedale Close, London, UB9 6DQ — 1534 yards to the southeast. London — 1325 yards to the southeast. Springwell Lane, Harefield, UB9 6PG — 1633 yards to the north. The Boathouse, Summerhouse Lane, Harefield, UB9 6HX — 187 yards to the north. Harefield — 1451 yards to the southeast. Uxbridge — 68 yards to the southwest. Park Lane, Harefield, UB9 6HJ — 1082 yards to the southeast. 11-13 High Street, Harefield, UB9 6BX — 1469 yards to the southeast. Summerhouse Business Park, London, UB9 6TH — 582 yards to the northeast. Chaplin House, Widewater Place, Moorhall Road, London, UB9 6NS — 73 yards to the northeast. Quay West Salamander Quay Harefield, London, UB9 6NZ — 129 yards to the south. High Street, Uxbridge, UB9 6JR — 1482 yards to the southeast. Harefield — 124 yards to the south. 60 Barrington Dr, UB9 6RL — 132 yards to the east. Swan Reach, Jacks Lane, Harefield, UB9 6HE — 283 yards to the south. 2-4 High Street, Harefield, Harefield, UB9 6BU — 1440 yards to the southeast. UNIT 1 SUMMERHOUSE BUSINESS PARK, CANAL WAY, Harefield, UB9 6TH — 537 yards to the northeast. 8 Barrington Dr, UB9 6RL — 167 yards to the southeast. 10 Linden Square, London, UB96 — 580 yards to the northeast. Uxbridge — 1451 yards to the southeast. Park Lane, London, UB9 6NZ — 97 yards to the south. Hill End Rd, London, UB9 6 — 1272 yards to the east. Hill End Rd, London, UB9 6JH — 1266 yards to the east. Harefield — 67 yards to the northeast. Bridge House, Royal Quay, Park Lane, London, UB9 6JA — 102 yards to the south. London — 148 yards to the south. Summerhouse Lane, London, UB96HX — 244 yards to the north. Harefield — 1482 yards to the east. Grand Union Canal, London — 119 yards to the north. Zone G Salamander Quay, Uxbridge, UB9 6NZ — 132 yards to the south. 34 Park Place, Harefield, UB9 6EJ — 1468 yards to the east. 1511 yards to the northeast.